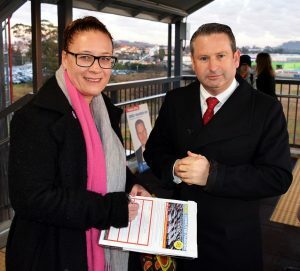 Campbelltown MP Greg Warren got out early this week to chat to commuters at Campbelltown station. He said commuters were eager to sign his petition calling for a multi-storey car park. Two months ago Campbelltown MP Greg Warren started a petition calling for a free, multi-storey commuter car park at Campbelltown train station. He wasn’t at all surprised that commuters couldn’t sign on the dotted line fast enough. “It is a horrible experience being a Campbelltown train commuter,’’ he says. “I speak as someone who is regularly forced to endure the sweat boxes. “No car parking spaces, services that are predictably unreliable and carriages without air conditioning – it’s disgraceful,’’ says Mr Warren. And yet none of this would be happening if Premier Gladys Berejiklian had kept her promise as transport minister in 2015 to build 450 more spaces for commuters at Campbelltown train station. There is no sign of any car park construction near Campbelltown station, as Mr Warren points out. “I have lost count of the number of times I have raised this issue with this Liberal state government,’’ he said. “But I haven’t lost count of how many times this government has seriously addressed my concerns because zero is an easy number to remember. “It’s difficult to fathom why this government want to spend billions on rebuilding Sydney stadiums that are barely half full, yet it won’t construct new car parks at stations that are bursting at the seams by 7am. “But the problem is not new. “This state government has had eight years to address the problem but has failed to do so. “If the Liberals are re-elected to government following the March 23, 2019 state election, Campbelltown commuters can bet they will have to wait at least another four years until relief is in sight. “The community want and need more parking spaces – it’s time the Premier listened and kept her promises,” Mr Warren said.